Editors’ note: Capital One has agreed to sell some 1 million of its retail brokerage accounts to E-Trade. See NerdWallet’s review of E-Trade. Capital One Investing may not have the name recognition of its more advertising-prone peers, but this full-service online broker stands out for low fees and portfolio-building options. For investors seeking simplicity, there are no account minimums or inactivity fees, and trade commissions are competitively priced at a flat $6.95. Of appeal to beginners are Capital One Investing’s self- and advisor-guided plans that feature lower costs for recurring investments, the ability to accumulate partial shares and an automatic — and free — dividend reinvestment program. Frequent traders may be turned off by the lack of a trading platform, and more advanced traders may not find the comprehensiveness they seek. More than 800 branches in eight states and Washington, D.C.
Automatic investing plan: Setting aside money for investing can be daunting for many beginners. Capital One Investing’s ShareBuilder Plan aims to make it easier. Investors can schedule investments of any amount on a weekly, biweekly or monthly basis, choosing from more than 7,000 stocks and exchange-traded funds. Each order processed will carry a lowered fee of $3.95. You’ll need to take that into consideration when deciding how much to set aside each period, but there are two more perks: You can turn the plan on or off at any time, and you can accumulate partial shares. Portfolio Builder: This tool simplifies the process — and cost — to invest in a diversified portfolio of ETFs based on asset allocation models. You select your investing style, an amount to invest on a regular basis and a fund family. Capital One Investing builds a portfolio of six to eight ETFs, and you are charged a flat fee of $18.95 for each order processed. As in the automatic investing plan, you can buy partial shares since you’re investing a dollar amount rather than purchasing a set number of shares each period. The flat fee offers a savings compared with investing in the ETFs individually, particularly because Capital One Investing doesn’t offer any commission-free ETFs. No minimum deposit and low fees: Capital One Investing requires no minimum deposit on brokerage accounts, making it appealing to beginner investors. The broker’s commissions are competitive. Its flat-rate $6.95 commissions are more expensive than those at some discount brokers like TradeKing and OptionsHouse, but they’re on par with or cheaper than those at other full-service brokers like Charles Schwab and TD Ameritrade. Capital One Investing also stands out for its low fees; it charges no inactivity fee, and broker-assisted trades are only $19.95. The broker offers more than 450 no-transaction-fee mutual funds, and trades of other mutual funds also are $19.95, which is less than at most of the other online brokers. Tools and research: For a brokerage that doesn’t have a trading platform (more on this below), Capital One Investing offers an impressive number of tools. You can use the site’s investment screener to quickly sort through ETFs, mutual funds and stocks based on criteria including 90-day average volume, dividend yield and fund strategy. You can also evaluate and compare similar funds using Morningstar ratings and performance. A What if I Had Invested tool lets you learn from your mistakes, showing what a stock would be worth today if you’d invested a certain amount on a past date. The site also offers charting capabilities, tracking alerts and watchlists, along with “heat mapping” tools that visually illustrate performance across several different investments. No trading platform: The brokerage doesn’t have a separate desktop or web-based trade platform. Instead, you’ll make trades through the Capital One Investing website, which is well-organized and easy to use and has a corresponding mobile app. Advanced or frequent traders will want a robust trading platform, but beginning investors — who seem to be the company’s main target — likely won’t notice this missing piece. No commission-free ETFs: Through its automated investing plan and portfolio builder tool, Capital One Investing gives customers access to ETFs at lower commission costs. However, the online broker doesn’t offer any commission-free ETFs. That’s a notable omission, particularly as competitors like Charles Schwab beef up their offerings. Limited investment selection: Capital One Investing has fewer than 500 no-transaction-fee mutual funds, which is far fewer than other online brokers including Fidelity and TD Ameritrade. Customers can trade stocks, mutual funds, ETFs and options, but not forex, futures or individual bonds. 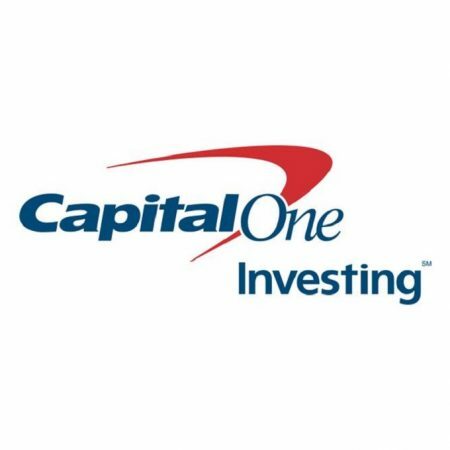 Capital One Investing is geared toward beginner investors, and the brokerage removes some of the daunting barriers to entry by requiring no account minimum and offering low commissions. Backed by a robust research library that will help new investors build a solid knowledge base, the automatic investing plan and Portfolio Builder tool encourage a regular routine for investing. All these tools are made even more accessible for existing Capital One banking customers, who will enjoy the administrative ease of putting all of their accounts under one roof. More advanced traders may be disappointed by the lack of selection, number of commission-free offerings and access to a trading platform.